Bergpracht has been producing fine soft cheese products using traditional recipes for more than 75 years. 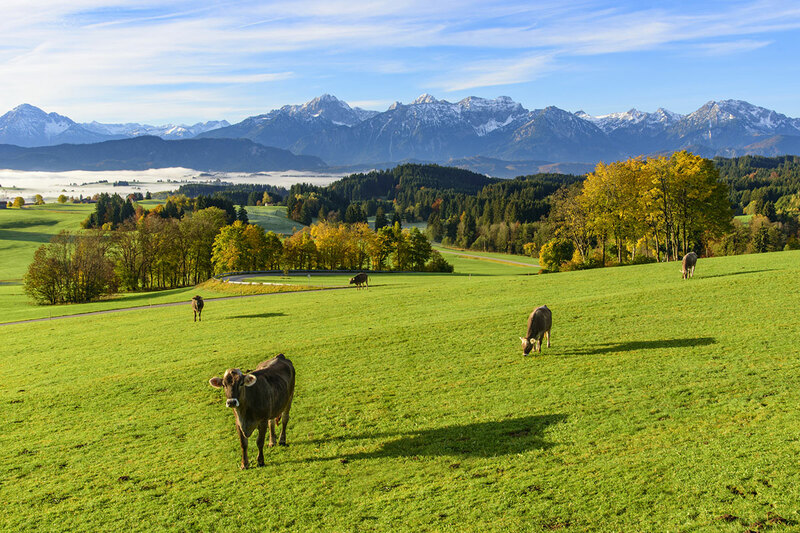 The milk, about 50 million liters a year, comes mainly from farms in the beautiful Lake Constance region. Bergpracht products are known and loved far beyond this region. So they are currently also u.a. exported to the following countries: England, Belgium, Luxembourg, Holland, Spain, Italy, Switzerland, Slovenia, Czech Republic, Hungary, Sweden, Finland, Israel and Korea. The medium-sized family business has succeeded in preserving the original taste of soft cheese from the Alpine foothills, although some modern technology is used. Soft cheese, such as Camembert and Brie, has been produced since the founding period, as well as semi-hard semi-hard cheese with white mold, in practical block format, for service counter and catering. Around 1981, the production of organic products began in parallel. According to the company philosophy, Bergpracht respects the highest quality standards and since then has worked exclusively with producers of Bioland and Demetermilch. All Bergpracht organic products have been marketed for decades in the natural food trade, but for many years also in the traditional trade. In 1985, the production of TRAKAYA shepherds cheese, a "Mediterranean" brine cheese made from cow's milk, started. In addition to the classic disc packs for the end user, a currently unique cube assortment for processors and the large consumer sector is produced. TRAKAYA cubes have an accurate cut, barely crumble and are ideal for use in salads, ready meals, snacks and pizzas. Customer-specific wishes regarding cube size, format, consistency, fresh or frosted variants are a welcome challenge for medium-sized companies due to their great flexibility. In addition, there are constantly new developments, such as the lumpy TRAKAYA spreads of cheese in various delicious variants - a real innovation. Similarly, the ajurvedic ghee - a clarified butter produced in the classical boiling process.